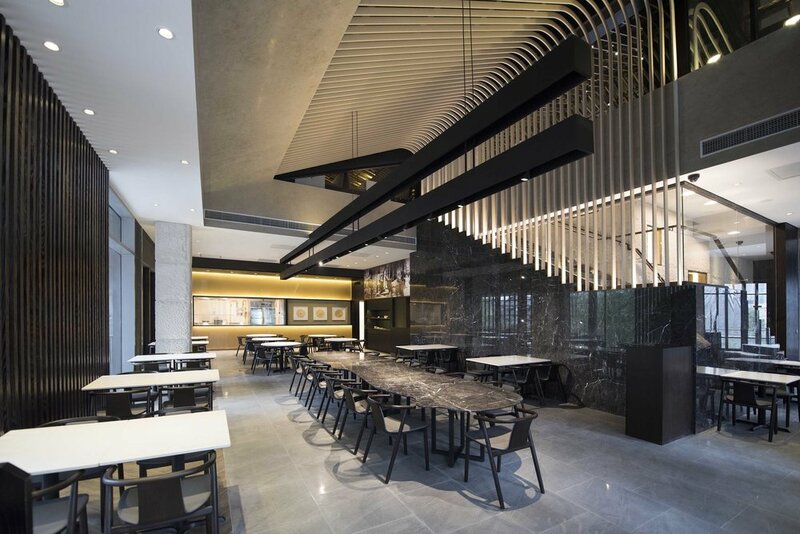 The brief for the 8,000sqft flagship restaurant for Tasty Congee & Wantun Noodle Shop, located at Swire Properties’ Daci Temple Sino-Ocean Taikoo Li Chengdu China, was to celebrate the client’s 70 years old Wontun noodle brand by upgrading its historical street-food status to a contemporary international identity. The new space is a cultural exchange between east and west, old and new, in Chengdu China. The design was driven by contextual narratives derived from Chengdu’s leisurely culture within Sichuan’s archaeological context. In Chengdu, people enjoy a contemporary lifestyle of eating outdoors and watching the world go by in a setting that is often juxtaposed in between layers of time. The key challenge was to create an ideal experience that could cater to a wide variety of customers. The design should entice and impress elite high-end customers without being intimidating or aggressive. 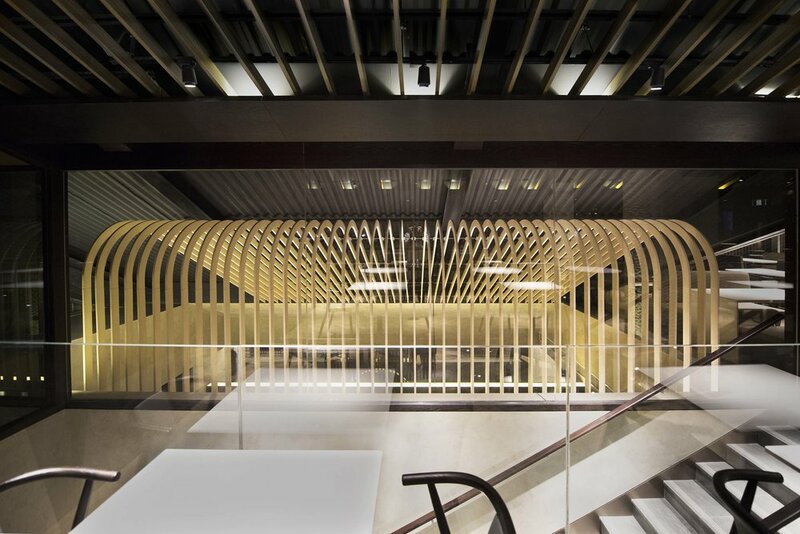 It requires a careful aesthetic approach that responds to local Chinese customers as well as global international visitors. The design should create a holistic customer experience, through the large mixture of single height, double height, flat and sloped three-dimensional volumes created by the building’s geometries. The solution was to create a tasteful design that does not feel sleek and pretentious, and rather, is welcoming and comfortable supported by a few highlighted design features. The main feature is an impressive 4.8m long marble table installation that can be seen upon entering, located in the center of the double height space. Inspired by traditional Chinese garden rock art, the table is full of playful curves and appears to be floating. It functions as a dynamic 18 person sharing table for multipurpose events. 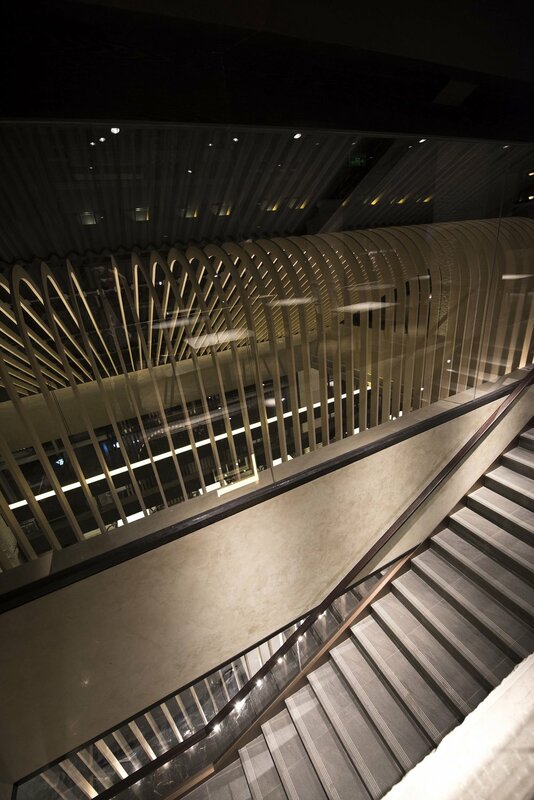 Interpreting the visual form of Wantun noodles, a series of long vertical metallic strands enclose a semi-porous staircase inside. The slats rise up the double height space and elegantly blend in with the sloped roof. They create an elevated drama which can be seen from the exterior, and entice customers to discover the upper level of the restaurant. The upper floor is characterised by a series of pitched roofs and a long shelving wall with a curated display of cultural artifacts, creating a cozy attic dinning experience with terraces and windows that overlook the historical Daci Temple.